1.Sleek lines with geometric element contemporary design, adds up characteristic and elegant decor style for our bathroom. 2.Multipurpose towel rack helps to complimenting your household fixtures, make your items within reach. 3. Enduring, peaceful style brings a casual and graceful appeal to your remodeled room, never out of date and reliable. 1.ONLY clean with a soft, damp cloth gently. 3.Maintenance period is 1-2 months, this care will maintain the metallic gloss finish. APLusee Home Life is a professional manufacturer that is concerned with the design, development and production of Kitchen & Bathroom Accessories, Kitchen & Bath Faucets and Sanitary Hardwares more than 10 years. UNIQUE GEOMETRIC ELEMENT, clear oval frame makes elegant cylindrical holding arm and smooth & prominent lines. Warm brushed nickel offers you a easeful look, the gentle stainless steel finish combines with the graceful styling, brings a simple and modern appeal to your bathroom. Overall size: L 13-5/8" x D 4-3/16" x H 2-3/8"(346 x 107 x 60mm). 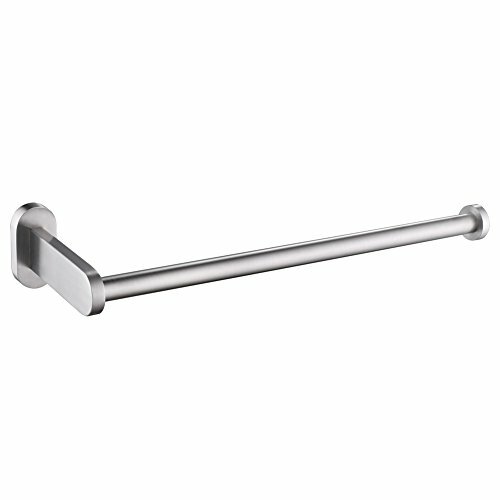 BROADENED & LENGTHENED BAR, unlike the ordinary towel holder, our towel rod is longer and wider, makes it can hanging paper towel under cabinet, counter in kitchen or bathroom. Adds functional storage and modern style to your limited interior space. Length of Holding Part: 12-9/16"(319mm). PRACTICAL OPEN ARM DESIGN, allows a flexible mounting option to meet your using habit. Larger hook can solves well the problem of falling objects from the opened end, in order to more convenient and much easier to hangs hand towels, paper towels, etc. Net weight: 0.59 lb (267g). HUMANIZED DESIGN, a. Maximally Spread out daily towels that drying more quickly to minimizes bacteria. b. Installs near your bathroom or kitchen sink, can easily reach for paper or hand towel to wipes your hands. c. Perfect for reducing clutter and creating much needed space to hangs items. 3 DIRECTION & SECURE INSTALLATION, complete mounting hardware included for attaching firmly, the traces was hided, don't affect the wall look. Cylindrical holding arm makes it can facing in right, left or vertically. If open end to the left or vertically would expose the small screw. If you have any questions about this product by APLusee, contact us by completing and submitting the form below. If you are looking for a specif part number, please include it with your message.